This is going to be very special concert, which will be recorded for release as a live album. Joaquin and a group of five of the area’s finest musicians, playing upright bass, cello, violin, percussion, and a vocalist, will perform selections from Joaquin’s album ‘Nuevos Comienzos’ as well as new pieces, composed especially for this concert event. The string trio will play arrangements composed by Joaquin for this concert. Flamenco chamber music to “soothe the savage beast and warm your heart”. Joaquin Gallegos was born in Santa Fe, New Mexico. He comes from a family of artists and musicians, starting music studies at age 7 and playing the guitar at 9 years old. Joaquin has made Andalucia his second home having spent several years living, studying and performing there and in the United States as well as in Latin America. He lived among gypsy clans in Sacromonte, Granada, learning the art of accompanying cante and baile. Some of Joaquins most important maestros have been Chuscales, Manolo Sanlucar, El Viejin, Emilio Maya and Antón Jimenez. Joaquin won 1st prize at the 2002 EXPO Flamenco Competition at the Festival Flamenco Internacional de Albuquerque and was a finalist at the 2007 II Concurso Internacional Niño Ricardo de Murcia. His first album, La Jornada, was released in 2005. Joaquin has recorded on many artists albums and toured with Flamenco Vivo Carlota Santana, EntreFlamenco and as a solo artist. His second album, Nuevos Comienzos, was released in 2015 and has received critical acclaim for its composition, innovation, and technical virtuosity. 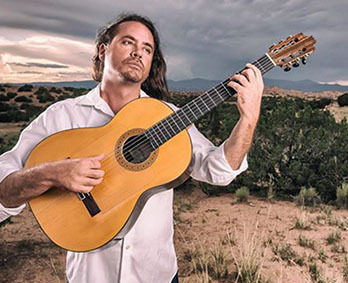 His fluid technical expression, deep rhythmic sensibility and prolific composing abilities have made Joaquin a sought after guitarist for solo performances, accompaniment for flamenco artists such as La Popi, Lakshmi Basile, Kina Mendez, Nino de los Reyes, Roberto Lorente, jazz, world and soul music collaborations with artists such as Rahim Alhaj, Consuelo Luz, and as a composer of soundtracks for films.